As previously mentioned, the staff, Governors and representatives from parents have been working hard this term to create a renewed whole school vision and strapline that we believe encapsulates the kind of school we are striving for Wolvey to become. I am delighted to share this with you now. 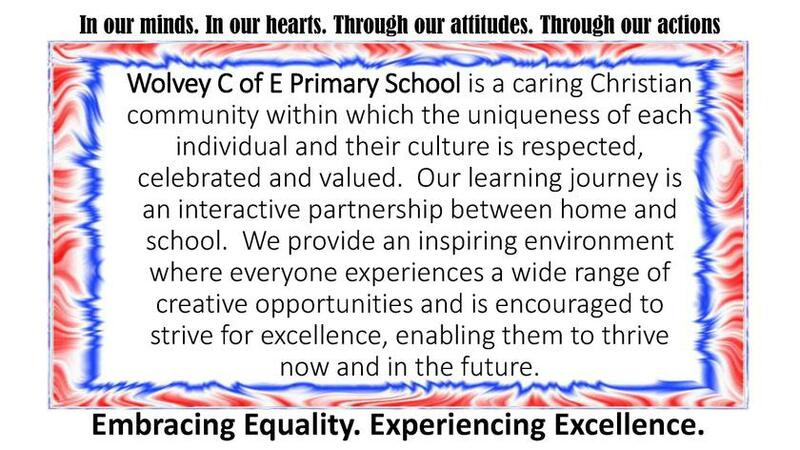 This vision, together with our strapline of ‘Embracing Equality, Experiencing Excellence’ will become a prominent feature of the school from January and will drive all the work we do as a home/school partnership. As part of the very clear message that Wolvey CE Primary School aims to become excellent in every way, we would also like to consult with you on a minor change to the school uniform which would be introduced on a rolling basis over a period of time. We are seeking the views and thoughts of all members of our community: parents, children, staff and local village residents/interested parties and so we would encourage you to visit the following link where you can read more details and have your say. This consultation will run from now until the end of January. Thank you for your continued support as we rapidly progress along our school improvement journey.